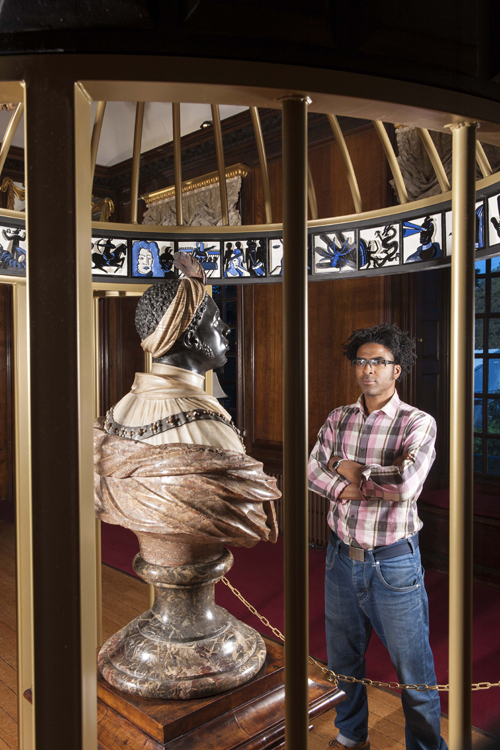 Call and Responses: The Odyssey of the Moor, a new commission for Historic Royal Palaces and the Royal Collection Trust, will be on display at the Queen’s State Apartments in Kensington Palace, London, from September 25, 2013 to January 6, 2014. The work is a response by visual artist Graeme Mortimer Evelyn to Dutch master sculptor John van Nost’s Bust of the Moor – an astonishingly beautiful and lavishly expensive sculpture commissioned by King William III in around 1689. The bust, made from layered, coloured marbles and semi-precious stones, depicts a black servant dressed in ‘Oriental’ fashion, but with an unmistakable slave collar. It is the only existing example of Van Nost’ use of polychromatic sculpture. There is a mystery that surrounds the commission, since a contradiction lies between King William III’s Protestant Calvinist austerity and the material expense of the work depicting the social position of the sculpture’s subject as that of a slave. The Bust of the Moor has consistently been considered by the Crown as one of the treasures of the Royal Collection and is the earliest recorded object within Kensington Palace. Evelyn’s large installation re-imagines lost narratives that may have led to King William III commissioning this exquisite and mysterious artwork. 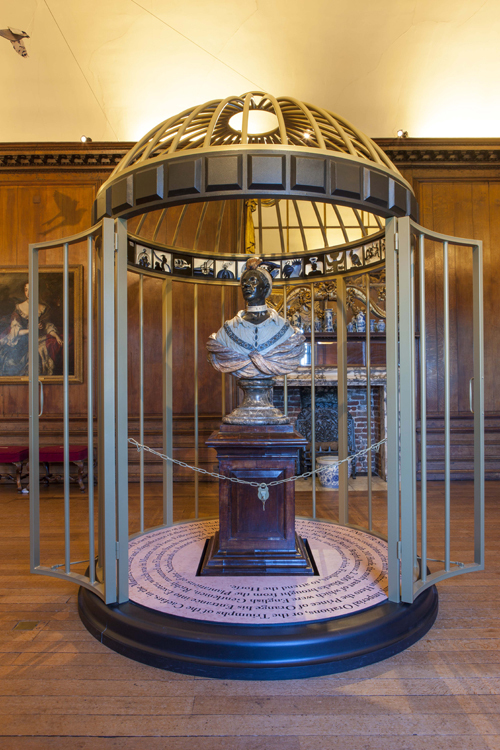 He places the bust within a man-size gilded birdcage, but with its doors flung open to capture the view over Kensington Gardens. The birdcage is a reflection on Queen Mary’s collection of exotic birds that were housed within the Queens Gallery at Kensington Palace. He creates for the Moor a dream of self-determination and freedom. Call and Responses – The Odyssey of the Moor is an enquiry into structures of physical space, social strata and philosophical ideas on human nature and survival. This engaging work opens up untold stories and access to a nationally renowned historic palace. Graeme Mortimer Evelyn is a British artist of Jamaican heritage. In 2012 Evelyn produced the exhibition Out of Many, One for Jamaica’s 50th anniversary at the Jamaican High Commission during the London Olympics. The display explored notions of identity and belonging that have helped to inform the Call and Responses project for Kensington Palace. He has developed a reputation for creating art in places of worship, public buildings and museums that subvert these settings – inspired by his research and the re-creation of alternative histories and mythologies. Evelyn is an artist with other notable firsts. In January 2011, as inaugural Artist-in-Residence at St Stephen’s Church, Bristol, he unveiled the permanent contemporary altarpiece, the Reconciliation Reredos. Built in the 14th Century, St Stephen’s is one of the oldest churches in Bristol and is of national and international significance as the church that blessed every ship that left the port, including every Transatlantic Slave Trade vessel that left the city. Evelyn is the first artist of African Diaspora heritage to produce such a permanent work in an historic church in Europe.